A couple of weeks ago, a Facebook follower suggested that I come up with a recipe for snickerdoodles. The kiddo loves snickerdoodles, too. But, I realized I hadn’t made them in a long time. And, I’d never really come up with a go-to recipe for them. So, it sounded like the perfect challenge. 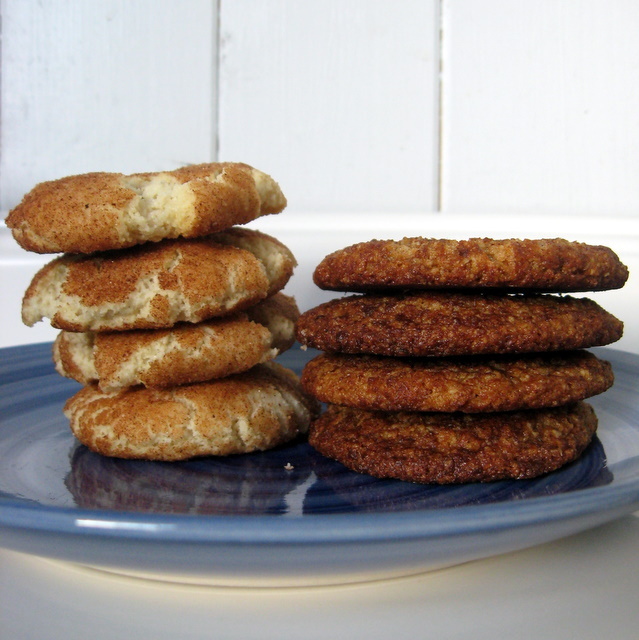 Never one to take the easy route, I decided that these particular snickerdoodles should be grain-free & vegan, too. Oh, and it’d be great if they could be refined sugar free, right? Well, after 5 batches of cookies, I’ve learned a thing or two. Number one: a snickerdoodle without white sugar is not a snickerdoodle. That doesn’t mean that it’s not a good cookie. But, come on. A snickerdoodle is all about tasting the cream of tarter and the cinnamon. Make it with palm sugar and you taste, well, the caramel flavor of the palm sugar. Harumph. Number two: Honeyville blanched almond flour really does make a difference. I knew this already. But, generally speaking, I prefer the skin-on almond meal. It has more flavor. But, in a snickerdoodle, you’re not going for nutty flavor. You’re going for snickerdoodle flavor. Skip the skins. Go for blanched. Number three: Earth Balance soy-free spread yields a softer, chewier, flatter cookie than organic palm shortening. I’m partial to the soft & chewy cookie, but I know that others prefer the crisp, fat cookie. Your call. So, today, you get a three-fer, just by changing up a few ingredients: a traditional soft & chewy snickerdoodle, a traditional crisp and puffy snickerdoodle, or a natural, nutty, not so snickerdoodle. Preheat oven to 400°. Line two baking sheets with parchment paper. In a small cup, mix the psyllium powder with the almond milk. Set aside. In a large bowl, beat the fat(s) until light and fluffy. Add the sugar. Beat until creamy. Add the psyllium & almond milk mixture. Beat well. Add the almond flour, arrowroot starch, cream of tarter, salt and baking soda. Mix well. Dough will be somewhat soft. Mix the cinnamon and sugar in a small bowl. Scoop out chunks of dough. Roll into balls. Roll the balls in the cinnamon and sugar, and place on the prepared baking sheet. Bake for 10-12 minutes, until cookies flatten somewhat and cinnamon coating is cracked. Cool completely. * Note: I’ve starred the combinations that I like best. All of the combinations work. Feel free to experiment and try it yourself. I have NOT tried with all Earth Balance. Nor have I tried with white sugar and almond meal. I would imagine that with all Earth Balance, you’d need more flour or less fat. With white sugar and almond meal, the proportions above should work. This entry was posted in cinnamon, cookies, grain-free, vegan and tagged cinnamon, cookies, grain-free, recipes, vegan. Bookmark the permalink. Thank you so much! Your recipe looks awesome! I can’t wait to try it! Happy to help. It was a fun challenge. I really enjoyed it. Oh, and if you’re not vegan and want to try replacing the psyllium powder + almond milk with an egg that could be a fun experiment. Be sure to report back which variation you try. I wondered what the psyllium powder was for! I think I’ll try an egg! Yep, it’s an egg replacer. You can also try 1 T. of ground flax seed or chia seed, but I find that the psyllium powder gives a texture I like better – more chewy. Oh my gosh! Yes please. They sound wonderful! Pingback: Tasty Eats at Home » August Adopt A Gluten-Free Blogger Roundup! Since we are grain free, but not dairy or egg free, I made these, with Honeyville almond flour and arrowroot powder, but used 1 egg, and part butter, part coconut oil. They are the BEST snickerdoodles I can remember ever having. The fats I used made them more of a crunchy cookie. Thanks so much for this resice!